Soldiers of Company G, 38th Infantry. Image Source: Fort Worth Library. The picture above is part of the Sandre Plummer Collection of the Fort Worth Library Digital Collections. Its description at the Fort Worth Library web site is “American troops appear to be resting from a march, possibly in the Batangas province of the Philippines.” The word ‘possibly’ was probably used as a precaution. 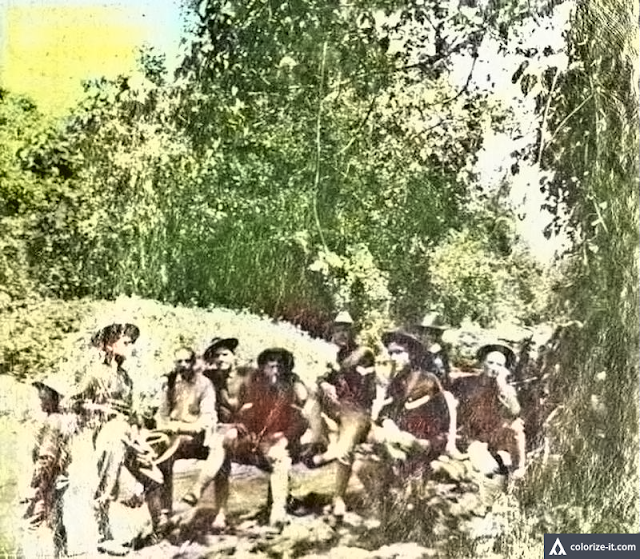 However, the collection appeared to have been of the “journey of Company G of the 38th U.S. Volunteer Infantry,” and this group was indeed assigned to the Batangas area. Chances are that the picture was really taken somewhere in Batangas. The original picture was not of the highest quality, hardly surprising given its age and the state of photographic technology at the time it was taken. It has since been enhanced using graphic editing software to improve clarity – as much as it could be improved, anyway – then colorized courtesy of Algorithmia.